The 'Heart for Hospice' monthly giving program raises vital funds for Mary Potter Care. All donations to 'Heart for Hospice' go towards funding the nursing care in the Hospice. This funding ensures each nurse has more time to offer care that is individual, meaningful and compassionate. The story of this family was shared with all who support 'Heart for Hospice' and we thought this moment was so special that we should also share it with you. "We recently had the honour and privilege of being invited into the room of a beautiful young lady (aged 25) who was hours from dying. Her parents gave us permission to meet their daughter, to hear their story and to take their photo (see attached) as a way of thanking you for the care their precious daughter had received over the previous four days. Thanks to gifts to the 'Heart for Hospice' program, her nurse had the time to sit with this family, to get to know them and talk about their daughter's life. During one of their chats her mother remarked that she loved fairy lights - she loved them all year round, not just at Christmas. Her caring nurse wondered if something could be done to bring fairy lights into her room one last time. So she approached the Foundation and within minutes fairy lights were in her hands. 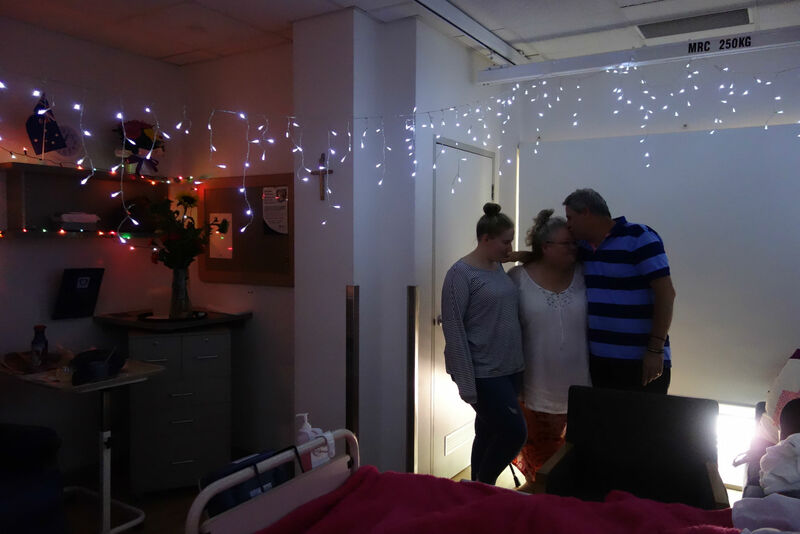 Time was running out so the nursing staff quickly changed her bedding, bathed her and draped fairy lights all around her room. When her parents and sister re-entered her room they couldn’t believe it. The room had been totally transformed. This simple act of love and kindness by her caring nurse brought tears of joy to her family and touched their hearts deeply. Early the following morning our patient died peacefully surrounded by her loving family under thousands of lights - each one lit especially for her. Even though this family was in the Hospice for only five days, they received care which they had never experienced before and they left with the most amazing memories they will treasure forever. Thank you to everyone who is part of our monthly giving 'Heart for Hospice' program and thank you for the difference you make for patients and families every day." If you would like to join 'Heart for Hospice' you can sign up today. Simply click on the link below or contact Phoebe on 08 8239 0119.